I've been to Bequia. It's a wonderful place to visit---small, unspoiled, easily navigable, and with just about everything that the majority of visitors to the Caribbean might want. On a return trip, I wouldn't pass up the opportunity to enjoy a whale steak, but doubt it would be available. If it were, however, the experience could never match the spectacle of the three enormous whales about 100 yards offshore that leapt completely out of the water in unison before me one autumn morning in 1992 on a nearly deserted beach south of Dewey Beach Delaware. I was walking and continued walking after observing the whales. Ten minutes later, these three whales again leapt from the water in unison in front of me. Apparently they had swam the same distance I had walked. Ten minutes and a half-mile or so further down the beach, the performance was repeated. It was one of the most powerful experiences of my life. "Whales" is a term that's used locally as a synonym for large soft crabs. Last night, Mrs. Yi and I enjoyed the first of the season here in Baltimore at Charleston Restaurant. It wasn't a "whale." For a soft crab, it was quite tiny; but one bite confirmed it'd been alive within the hour. Another selection on the tasting menu, which is the format at Charleston, was Carolina Squab. The portion was but a portion cut from one side of the breast. It was delicious, garnished, and properly cooked medium rare. This is the first time in years---if ever---I've seen squab on a menu in Baltimore. It would be great if this could prove to be the beginning of a trend. Above is the shad roe we fixed last Friday (Good Friday), while sipping the Deep-Sea Diver of the previous post to soothe Internet frustation. Originally, I intended to duplicate one of the two recipes from Bob Kinkead's Kinkead's Cookbook, Ten Speed Press, Berkely, Toronto. Although I've never had the opportunity to be there when shad roe is in season. In my estimation, Kinkead's Restaurant in Washington, DC, approaches seafood with as much diversity and sophistication as any other seafood restaurant in this part of the Mid-Atlantic. I've been enjoying shad roe all my life and cooking it for many years---with mixed results. My initial thought was to prepare one of Bob Kinkead's two recipes with an eye to the basics---basics that could have related to those past mixed results. All his additional touches would be---let's say gravy, and the kind of gravy likely to require not only a good bit of talent, but a good bit of time. Considering my limitations on Friday with respect to both, definitely this would be back to basics. We did go so far, however, as to duplicate Mr. Kinkead's Parsley Salad, which accompanies one of the shad roe dishes in his book and and also the shad roe dish in the photograph above. It's a salad that works great with shad roe. Rather than plagiarize Bob's recipe, I'd rather you purchase his book. You'll be glad if you do. To my mind, it's one of the most exciting seafood cookbooks to be published in recent years. What I will share from that book is one very important technique for preparing shad roe that makes a huge difference. It doesn't appear in any other cookbook or any other recipe for shad roe that I've seen. It's to soak the shad roe in milk for at least three hours or overnight prior to preparing. As a result, the flavor of the roe becomes more mellow as opposed to strong in the sense that gives some people reason to refer to shad roe as "an acquired taste." In the interest of a fresher and more mellow flavor, I also try to purchase raw shad roe that's light in color rather than roe that's darker in color. The differentiation probably has to do in some part with the presence of blood. Finally, I'd like to be cavalier enough to take exception to a growing trend espoused not only by Bob Kinkead, but also by other highly respected modern cookbook authors and chefs. That is the movement toward cooking shad roe "medium rare" or until "a little pink in the middle." Let me first assert that with most meats and seafoods---even pork and chicken--- I take pride in having always been ahead of the times in the movement toward "less cooked." For shad roe, Kinkead's Cookbook stipulates three minutes on each side in a pan over medium-high heat. That's enough to cook the roe, but not for the thousands of little eggs to be as distinctly and individually, though minutely delicious as when further cooked. Mrs. Yi helped clarify this point by once comparing the taste of medium-rare shad roe to grits, which incidentally, are often served with shad roe as a side dish. I say let the two be more distinct. 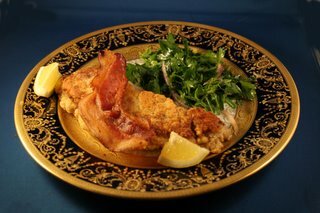 At the same time, let me say Bravo for Kinkead's method of breading shad roe by dipping it first in buttermilk, and then into a flour-cornmeal mixture. However, before doing so, I first poached the raw roe for several minutes. With my points made and with thanks to Kinkead's Cookbook for clueing me in to first soak shad roe in milk and then later how best to bread it, here's what my own cookbook one day will be likely to proclaim as the best basic way to cook shad roe. When purchasing shad roe, if you have a choice as to color, lighter should work better. When you get the roe home, very gently wash it in in cold water to remove any excess membrane---but being certain not to damage any membrane covering an egg sack. Then soak the shad roe in the milk, refrigerated, overnight, or at least for several hours. When ready to cook, first saute the bacon in a medium sized frying pan until brown, then remove to crisp on paper towels, leaving whatever fat is rendered in the pan. Combine the cornmeal, flour, salt and pepper, and pour the buttermilk into a shallow container. Next, remove shad roe from the milk, rinse, and pat dr. Then poach in 4 cups of simmering water with a little lemon juice for one minute. Remove, dip first in the buttermilk, then into the flour/corn meal mix. Add the two tablespoons of oil to the bacon fat in the frying pan, and turn up the heat to medium high for a minute or so. Then saute the roes on each side for three minutes. Each side should be brown and crispy. Transfer to a paper towel for additional crispness. Serve the roe adorned with lemon wedges for squeezing and with the bacon on top.